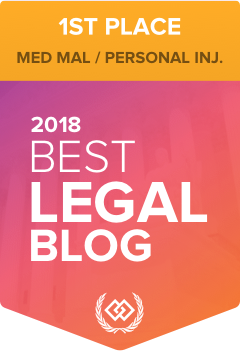 With a very special thank you to all of our blog readers and those within our online sharing communities, we are excited to announce that Levin & Perconti’s Illinois Nursing Home Abuse Blog has won 1st place in the Medical Malpractice and Personal Injury category by The Expert Institute’s 2018 Best Legal Blog Contest, one of the largest blog competitions of its kind. Levin & Perconti’s Medical Malpractice blog was also a 1st place winner in 2017 making this a consecutive winning year for our online content to shine amongst the best. In 2019, we look forward to providing additional legal suggestions and will continue to build a resource of newsworthy information about the struggles of long-term care communities right here in Illinois but also across the U.S.
A Toronto nurse has been charged with the deaths of 8 nursing home residents. The victims died in nursing home facilities in the Toronto area between 2007 and 2014. The woman was charged with first degree murder in all 8 cases. According to the Associated Press, AP, the nurse was an employee of Caressant Care Nursing and Retirement Homes, which owns and operates more than a dozen facilities in the south Ontario region. The administration of medications is one of the common requirements of nursing home staff members. Typically, prescription medications are kept in a locked area, and only caregivers are able to access it. While it is possible for medication mistakes to occur, they happen infrequently. The details of this case indicate that the nurse provided patients with overdoses of medications, which caused their deaths. Nursing homes are required to provide proper care to their residents and must ensure their safety and wellbeing. This was not the case for a woman who died after allegedly receiving neglectful care in a nursing home. The woman’s family filed a lawsuit in Cook County against Alden Estates in Barrington, IL. The lawsuit states that the nursing home failed to provide proper care and the woman died as a result. The lawsuit requests a jury trial. The woman in this case suffered from respiratory distress and also developed pressure ulcers, according to her relatives. Respiratory distress is a serious condition that requires immediate medical treatment. The situation should be considered a medical emergency and the patient should be seen by a physician as quickly as possible. Any delay in treatment could cause serious harm or even death, as it did in this instance. The caregivers allegedly did not properly supervise or monitor the woman and therefore did not realize that she was suffering from respiratory problems. Nursing homes are supposed to provide proper care and supervision to residents. In many cases, families choose to place their loved ones in nursing facilities because they feel that they will receive the type of monitoring and support they require. Nursing homes are not always as safe or supportive as we may hope. In one recent case, a woman died after suffering serious injuries which were allegedly not properly treated. The medical condition worsened and led to her death. The woman’s family filed a lawsuit seeking damages for her death due to negligence. Nursing home residents are usually elderly and often have various medical problems and limitations. Nursing homes are required to provide their residents with the care and supervision necessary to keep them safe. Neglectful care occurs when staff members fail to assist residents with their needs. Nursing homes are legally required to provide adequate care according to the Illinois Nursing Home Care Act. A new elder neglect lawsuit was filed recently in Cook County alleging mistreatment by home health caregivers. The complaint, filed last week, can be viewed online in full. Several different Chicago home health companies and facilities are named in the complaint, which seeks to hold the entities accountable for the actions of their employees in the scope of their employment. The plaintiff in the case is a man filing suit on behalf of his now-deceased father. The father was receiving care at his home. However, in mid-November of 2011, the senior was brought to a local hospital for a range of problems, including several bed sores, an infection, diabetes problems, and sepsis. His lower leg was amputated to stave off the infection, but the senior died a few days later as a result of complications. Unlike seniors who receive aid from at-home caregivers, those in nursing homes have virtually zero control over the actual front-line workers on whom they rely. Upon moving into a long-term care facility, residents immediate count on the individuals who were hired for basic tasks–preventing falls, proper grooming, ensuring nutrition, and more. When those caregivers leave, it is the owners and operators who make decisions about hiring new employees. Residents are left out of the process entirely. Those of us who work on cases of nursing home neglect appreciate that this theme of complete reliance on others is at the center of the nursing home resident predicament. Much like the trust a medical patient places in their surgeon upon being put under anesthesia, nursing home residents (and their families) must rely on caregivers. In fact, the ultimate trust is actually places in the owners and operators of the homes, who make decisions about hiring caregivers, ensuring adequate resources, sufficient safety policies, and more. Obviously all nursing home residents deserve to receive quality care every day that keeps them safe from harm. However, there are times when caregivers will, unintentionally, make mistakes. Like any other human, a worker may accidentally fail to check on a resident, forget a medication, or make a similar blunder. When that happens, if harm results, it is only reasonable for those responsible to pay for the consequences of the error. That is not necessarily a permanent condemnation of the individual who made the mistake–it happens. But none of that changes that the fact that all of us–from doctors and nursing home workers to care drivers and lawyers–are responsible for the results of our actions, regardless of our intentions. In an ideal world those responsible for accidents in nursing homes would immediately admit the error, explain the situation, and do whatever possible to make it right. Sadly, that sort of openness and honesty is rare. Instead, many caregivers (and owners and operators) engage in the exact opposite conduct; doing everything in their power to avoid any and all accountability. Far too many in this situation refuse to share information, make up excuses, point blame elsewhere, and otherwise fail to be forthright. This usually acts as a second blow to nursing home residents and their family members who are simply trying to understand what happened. Looming Problems with Alzheimer’s Care in Nursing Homes? America is “graying.” The Baby Boomers are retiring, and over the next few decades the percentage of the overall country that is in their traditional “golden years” will steadily increase. This obviously presents a host of challenges at all levels of society–from the individual family up to the national government. One of the foremost issues implicated by the demographic shift is elder care. Do we have enough skilled nursing facilities, assisted living homes, at-home caregivers, and other support services to accommodate the rising needs? Those are difficult questions. So far, most who have looked closely at the current state of the situation note that we are woefully unprepared to provide the aid that will be needed in the coming year. Not only are advocates worried that there will not be enough access to necessary services, but there are also concerns about the quality of the services that are performed. Traditional nursing homes–known as “skilled nursing facilities”–are able to provide a degree of actual medical care at the facility itself. Of course, caregivers provide support–like making meals, washing clothes, help with grooming, and more. But they can also provide more sophisticated treatments. However, there is a limit to the scope of care available in these locations. When a serious medical emergency strikes, it is critical that the seniors in the facility be taken to an actual hospital to receive in-depth treatment or emergency services. Sadly, there are circumstances when caregivers at a nursing home do not act in a timely fashion to ensure their residents receive the hospital aid they need. That seems to be what happened in a matter which led to a trial that ended last week.